Last year my husband and his partners bought a small 30 room hotel that was in desperate need of an overhaul. 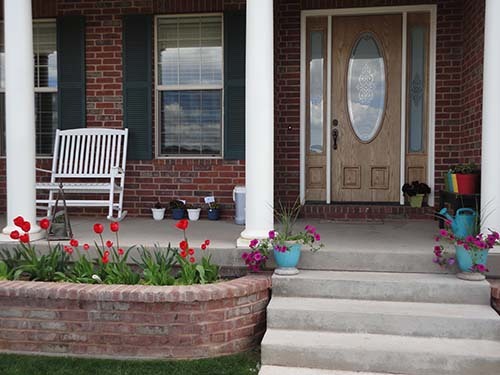 As my Mother and I scoured through every decorating magazine we could find looking for ideas we came across a picture of a front porch that was covered in flower pots. This collection had every size, shape, and style of pot imaginable. There were a few chairs thrown into the mix but mostly it was just plants. 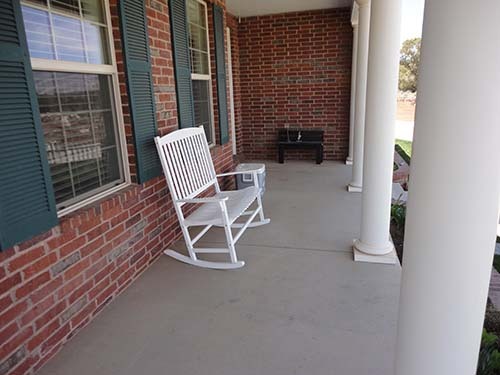 We decided this would be the goal for the front porch of the new Victorian Inn, unfortunately the picture doesn’t do the porch justice as in real life it is quite marvelous. 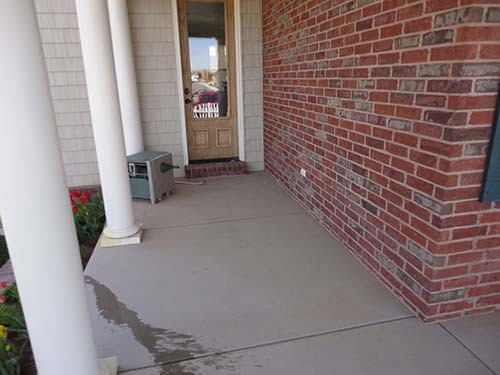 After we had completed the ‘necessary’ project of making this the most amazing front porch of any motel in the state I just knew I needed to make the same change to my front porch at home. 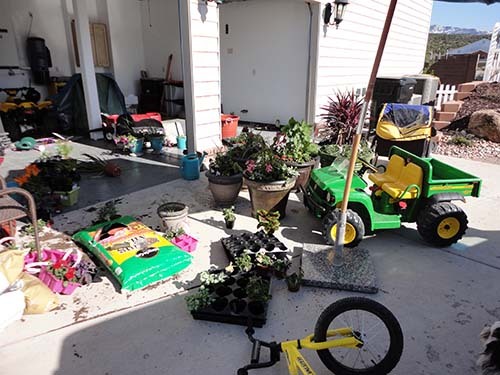 This month has been the month of flower pots. I have been slowly collecting pots and making list after list of possible plants to include in the pots. I believe my project has made a drastic improvement, although I would like to continue to add more containers and another piece of furniture or two. The front porch is my home’s best feature. I wonder if it feels neglected after being left naked all these years? The pot on the hose reel is home to an asparagus fern and some red spiky flowers (I hope my vocabulary isn’t too technical). The pot on the table is one red Geranium planted and cared for by J5. The pot near the pillar has a corn stalk of some kind along with pink Geraniums and Dead Nettle. The small pyramid cages a White Tipped Ivy. 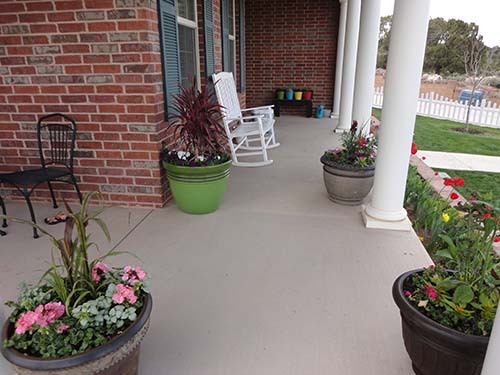 The three pots in the middle (there are 3 but the picture only shows 2) are planted with a variety of annuals including: Petunias, Snap Dragons, Sweet Potato vines, African Daisy, and more. 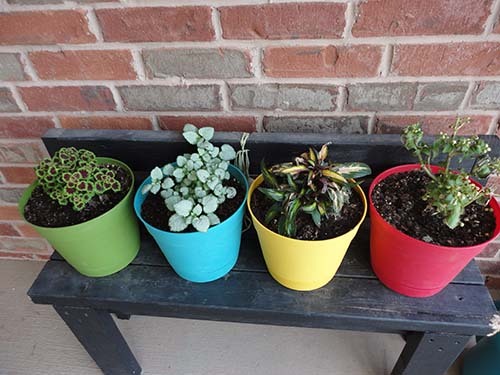 The green and yellow pots have different varieties of Coleus. The blue pot is Dead Nettle. The red is a white (I hope!) Impatient. This is the mess I sat in for 2 days while working on this project. 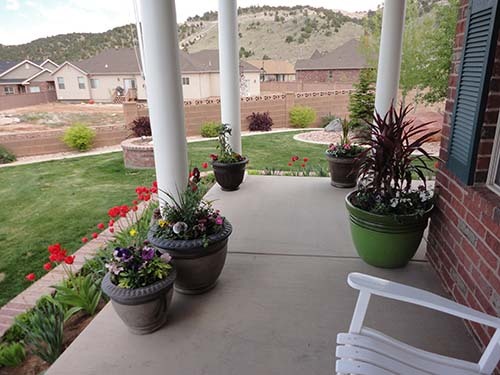 As I look at fabulously decorated front porches in magazines I want my own home to be as inviting. However, I have a problem that is rarely addressed in the advertisements; the WIND BLOWS VERY HARD HERE!!! I am afraid to get too creative with furniture, wall hangings, and other light weight props because I don’t want them to be carried off to the neighbor’s yard when the afternoon gales pick up. I will be keeping my eye out for heavy weight accessories. I would also love to hang an outdoor drapery of some sort but my north facing porch gets a limited amount of sun as it is and I really don’t think the fabric would withstand the wind. Maybe one day we’ll give it a try.